It was nearly a year and a half ago that Dave told me he was probably dying. I sat on the porch swing on my terrace, phone pressed to my ear, the leaves on the one visible tree in the courtyard below me trembling in the breeze. As Dan's brother—my not-quite-legal brother-in-law, my good friend—talked evenly and scientifically about his neurons separating from his muscles, I felt, strangely as though I knew what he would say milliseconds before he said it. This let me take in the news with a calm that matched the way he told it. I listened, asked questions, and didn't cry. "I'm sorry," Dave said. "I didn't mean to talk about all this. This was supposed to be a happy birthday call." "I asked," I reminded him. Of course I'd asked about his health when he called me on that particular birthday. He'd been going for tests for months, trying to find the cause of his shortness of breath, the weakness in his legs, his sudden drop in weight. The doctors had ruled out lupus, Lyme disease, and HIV. They had, it seemed, ruled out everything for which there was a test. This left us here, facing the most ruthless of possibilities: amyotrophic lateral sclerosis (ALS). It's the speed demon serial killer of motor neurons also known as Lou Gehrig's disease. "I feel," Dave told me a few weeks later, diagnosis confirmed, "as though I've been found guilty and given a life sentence, though I've done nothing wrong." That time, both of us cried. Dan and Dave are identical twins, and as much as those words imply closeness and affinity, I can't think of any words that truly describe the deep interconnectedness these two men share. 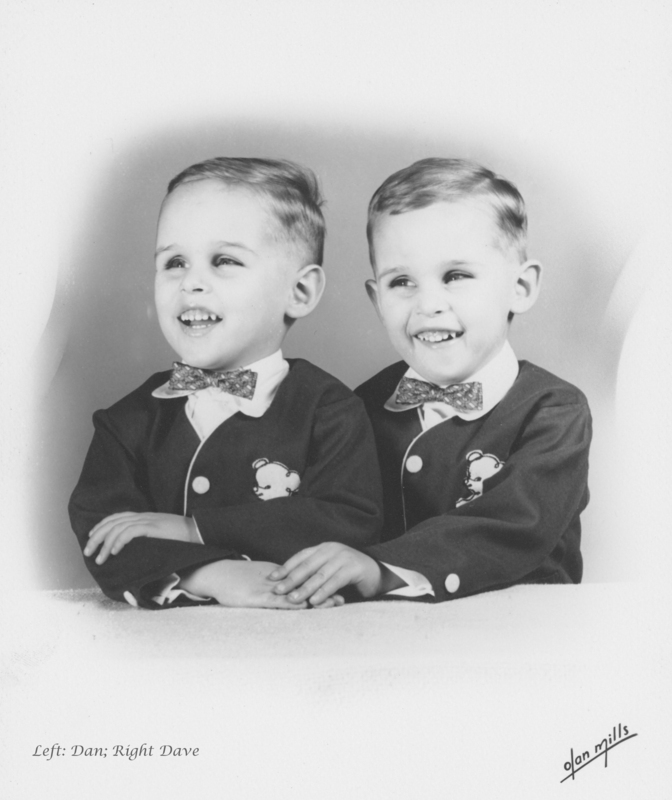 Born blind in the early 1950s, they were sent together, at age four, to boarding school. Think about that. Picture your own child at four, not merely toddling through the door of a classroom for a few short hours of preschool, but leaving home to sleep in an open dorm five days a week. They were cared for by overworked, underpaid strangers, and weren't allowed a single phone call from home. Such calls, the theory ran, would only serve to make the students homesick and slow their process of adjustment. It's nearly impossible to imagine, but if you or I had a sight-impaired child at that point in history, we'd be assured by the top educators and doctors of the day that sending our little one to an institution like this was the one right thing to do. The School for the Blind was a harsh place but it wasn't entirely without pleasures. There was playtime with friends. A library filled with braille books. A kind teacher who took the time to tenderly apply lotion to each of her students' hands at the end of the school day. But what really made it livable for the twins, of course, was that they had each other. In the crowded dorm, their beds were side by side, so that at night, after a day when the housemother had been particularly short-tempered, or Dan or Dave had squabbled with a friend, or they simply missed home more acutely than usual, they could reach over and clasp hands. Recently, a friend of mine, at seeing a photo of the twins at age three, marveled at the way they sat shoulder to shoulder, Dave's fingers resting on Dan's. "At that age," she laughed "I'd have expected them to be chasing each other and clobbering each other over the head." But from what I know, Dan and Dave have always been loving toward each other. As small boys, home for the summer, they taught themselves four-handed piano so as to never wind up arguing for a turn. In high school, when pitted against one another for a wrestling match in gym class, they stayed up late the night before, figuring out how to stage a tie. These days, 16 months post-diagnosis, the wrestling match is between Dave and ALS, and the disease has no interest in an even score. It's whittled him from 208 pounds to 128, robbed him of the ability to walk or stand independently, and to use even a thick-handled utensil for eating. Dave's lung capacity is now down to 23 percent so that talking can exhaust him. Thankfully, though, Dave has not given up on talking. He's always been a wonderful conversationalist. We discuss the books he's reading—poetry, science, and theology. He troubleshoots technology glitches with us; recites the remarkable poems he composes in his head; and describes his most recent losses, sometimes matter-of-factly, sometimes with unabashed grief. Dave has said that if any good has come of his illness it's that he can really feel how much love there is in his life. It's easy to see what he means. He's adored by so many, besides Dan and me. His wife Emily, his mother, stepfather, sisters, aunts, uncles, cousins, and countless friends. Everyone has pitched in where they can—assistance with personal care, rides to doctors' appointments, homemade dinners dropped at their door. Dan and I each spend a day a week with Dave while Emily is at work. I love my Dave days. I stretch out on Emily's side of the bed and we talk quietly or I read to him, then help him type something or make a call, and bring up our lunch on a tray, feeding him if it's difficult for him to manage on his own. Years back, Dan taught me a phrase for the tangible, day-to-day ways we care for the people in our lives. Practical love, he calls it. I think of my dad who always showed up at my door with his tools in case anything needed fixing; my friend Dawn who called to warn me when the sidewalks were especially slippery last winter; my friend Julia who helped me pack my books, then drove me and my belongings across state lines to the house Dan and I now share, though she hated to see me move. And, of course, I think of the thousands of small tasks we do as we parent. Lately though, when the term practical love comes to mind, what I picture is Dan walking behind Dave, hands tucked beneath his twin's skinny arms as he steadies him and guides him toward the bathroom or to bed. "I've got you, Brother," he assures Dave, and I think about how that fact has been true for the whole of their existence. How enviable. How heartbreaking. Everyone any of us has ever loved is mortal, and there's not a damn thing we can do about that other than keep on loving each other, as reckless and impractical as that may seem. Oh, Ona, I had no idea. I'm so sorry. What a terrible thing for you all to have to go through. I can only wish you strength and be glad that you're now closer to Dan to help him through this. big love to all three of you. Ona, what a beautiful piece of writing, even if the topic breaks my heart. And as a caregiver myself, I love the term "practical love" and will be appropriating it. Hugs and love to all of you. So precisely and gently observed--the faithfulness of practical love. And the suggestion or unsaid undertone that this is the love that fends off death. Can't prevent it, but eases the sharpness of it. The sandwich when we're hungry. The reader opening to just the right page. Thank you, Ona, for the beauty of this reflection. Thank you, Dave and Dan, for the the dailiness of your love. Thank you, Ona, for writing so clearly and beautifully about practical love. Thank you Dan and Dave and Ona, for living it. My love and support to you in this bittersweet time. Thank you all for such loving and supportive words! What a beautiful tribute to your brother-in-law. ALS is so cruel--my father died from the disease 20 years ago this August. I think about him a dozen times a day. This illustrates the helplessness and fear perfectly. All of my best to you. Thank you, Trish. So sorry you lost your dad to this devastating disease. What a fierce and beautiful column about a terribly sad process. How lucky you all are to share both your practical and impractical love. This is beautiful, Ona. It's mind-boggling how something so awful, so utterly unfair, can't exhaust love. Much of it from here to the four of you. Oh that last line! This is the great sadness and the wonder, maybe catastrophe, of love. I am feeling it now as I morn my beloved Grandpa. You reached in and showed us beautiful Dave, but also showed us so much about close hearts and the nature of love.